I just had a really tough hour and a half. I know many of you parents have been through this, but maybe not as late in the game as I have. The Bean used to nap like a charm – when she was tiny. I could set my watch by the hour and a half that she was up between naps. As she got older, she still went down well, and I was the envy of some in my playgroup. I’m not sure exactly when it changed. A year ago, I was attempting to use the Cry It Out (CIO) method to get her down for naps, and I gave up pretty quickly when I was spending as much time crying as she was. Over the past few months, it has gotten so the only way I can get her down for a nap is by taking her for a drive in the car. She transfers from her car seat to her crib like a dream, and will often sleep for 2 or more hours after falling asleep that way. I’m always out and about, so it is sometimes pretty handy that she falls asleep on our way home, but other times it’s a drag to have to head back home instead of finishing my errands. Lately, though, I’ve been feeling imprisoned by the need to drive her around for nap time – not to mention the extra expense and pollution associated with driving the car. It has also made me feel like I’ve failed in some way. I “should” myself a lot: SHOULD have gotten her on a schedule at 6 months like (the mythical) everyone else; SHOULD have been tougher with the CIO a year ago; SHOULD sacrifice whatever I need to to make this right. 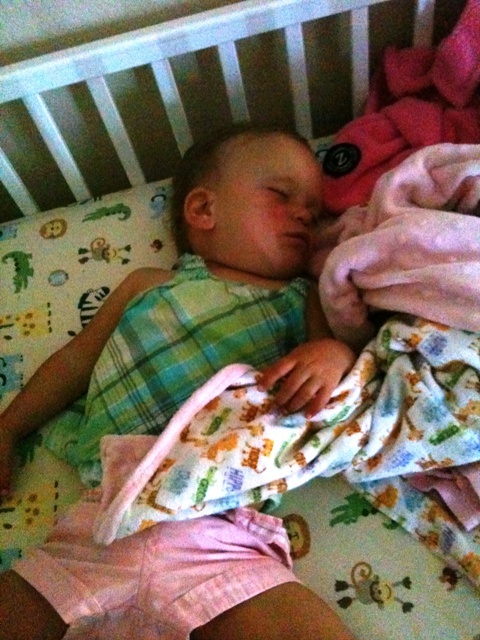 But what I feel like I’m sacrificing, when I try to get her to nap without the drive, is my own sanity. Today, I decided we were going to give it another try. I’m not sure why I thought it was a good idea – maybe it’s because I’d just had an amazing massage and felt good. At first, I thought we’d sit on the couch and just relax together for a while. I figured it might help her to calm down and get sleepy (sleepy is very different from tired) if we snuggled and sang. But that’s when the temper tantrum started. So I let her thrash around on the floor for a bit, and when she calmed down, I picked her up and tried again with the snuggling. No dice. At some point, the monster left, and my beautiful daughter was back. After about 20 minutes of that nonsense, I put her in her crib, but then hung out on the couch in her room, reading email and otherwise staying busy on my iPhone. I thought that if she saw that I hadn’t abandoned her, she would calm down more quickly. Nope, that didn’t work either. At the 50 minute mark, I walked out of her room and closed the door, and then started sobbing. I’m actually impressed that I lasted that long. I credit the amazing massage for my mental and emotional fortitude up until that point. After some encouragement on Facebook from my cousin and a close friend (thank you ladies), and a glass of wine (I don’t mind admitting), I managed to sit through another 28 minutes of slowly diminishing cries until The Bean was finally asleep. Ahhhh, deep breath. Tomorrow we’ll be driving home from a birthday party at exactly nap time. I guess I’ll have to save my next attempt at non-driving naps until Monday. Thank goodness I’ll have that same close friend over for some packing help that day – we’ll drink the wine together! Posted in Life, Naps. Bookmark the permalink.